Effective Focal Length (EFL) is the focal length affected by the camera’s crop factor. The numbers in the lens’ manual show some focal length values that this particular lens can use. For instance, 15-30mm means that the lens can be anywhere from 15 mm 30 mm. Of course, that explains it, right? Let’s take a closer look at all these terms. The “Crop Factor” is the ratio of a given sensor to the standard 35mm sensor, also known as a full-frame sensor. This element determines the actual or equivalent angle of view and hence visible area of the lens on the given camera. A lot of photographers with the two most common sensor crop factors: 1.6x for Canon, and 1.5x for Nikon and others. But let’s have a look how is this number calculated and how does it affect your final photo. So, the clue is the diagonal dimension of the sensor. The crop factor is the ratio on the full-frame diagonal to the diagonal of the sensor we calculate. Pythagorean theory will help us to calculate the diagonal knowing both horizontal and vertical sides of the rectangle. 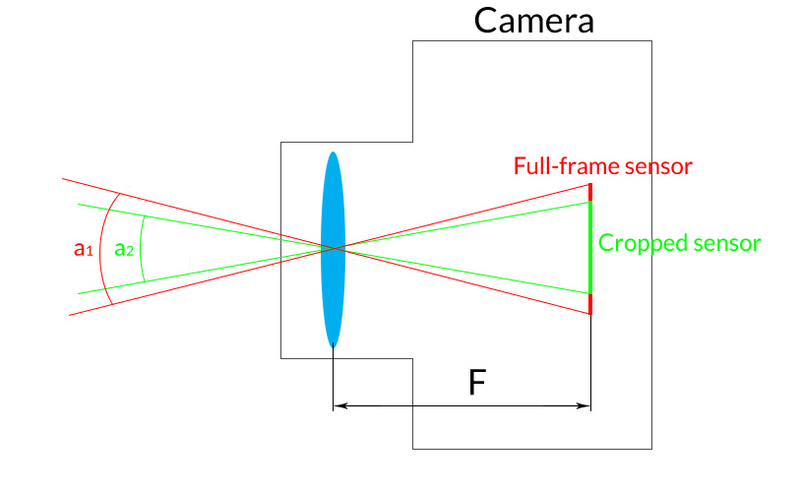 To find a crop factor of any given sensor, we need to calculate the diagonal. In case of the amateur level, Nikon DSLR cameras the dimensions are 23.6mm x 15.6mm. So the crop factor is 43.27 / 28.29 = 1.53, rounded down to 1.5 for convenience. Using same logic and Canon specs we can quickly calculate its crop factor. 43.27/26.68 = 1.62, rounded down to 1.6 for convenience. The standard focal length is what the manufacturer writes on the lens. But the crop factor affects it. So, the effective focal length is the actual resulting value that the lens has on the camera with the crop factor adjustments. For your reference, sometimes it is called Effective Focal Range. As you can see with the same physical focal length F, the angle a2 is smaller than a1. This fact means that on the cropped sensor you actually see the narrower area through the viewfinder. In reality, this narrow fielf of view effect is the same effect as if you zoomed in a little bit. And so this virtual zoom in focal length is the effective focal length. Hopefully, it clarified things instead of making them even fuzzier. And finally, we made it to the magic formula that will help you to understand what your lens is capable of. In other words, Effective Focal Length is equal to Focal Length multiplied by the Crop Factor. As simple as that. For instance, if you have a lens 24-70mm, then the actual, effective focal length on the amateur Nikon camera with crop factor = 1.5 will be 36-105mm. This focal range increase naturally affects the angle of view because the longer the focal length, the narrower the angle. In other words, the 24mm lens with the 24mm set as current focal length delivers 36mm on the camera with 1.5 crop factor. This fact is neither good nor bad. For a landscape it can be bad, rendering your wide lens not as wide. As opposed to the telescopic lens, where it increases your reach. 300mm turns into 450mm, which is an incredible level up. The table below shows some common crop factors for the modern cameras. With those values, you can easily calculate the effective focal length and know your photographic equipment better. This Wikipedia article has a wider list of sensors. I’m sure with the new knowledge you can now easily calculate all crop factors you need. Wow! Excellent technical information, but makes my head spin…. hi Terry, thanks. Did you find it hard to understand?